When the National Hockey League announced it would be heading outdoors in 2008 for the first-ever Winter Classic in Buffalo, New York, it was, understandably, met with a ton of excitement. The opportunity to bring the game of hockey back to its outdoor roots was new and exciting for NHL fans, and it showed: the game drew over 71,000 fans, with 3.75 million more tuning in from home, per Sports Media Watch. That game marked just the second meaningful outdoor game in NHL history, and the first since the 2003 Heritage Classic in Edmonton, Alberta. Since that first Winter Classic in Buffalo ten years ago, the NHL has played 23 outdoor games, with two more scheduled for next season at Notre Dame and Lincoln Financial Field. Naturally, the hype around the outdoor setting has diminished some over the last decade. The spectacle isn’t brand new like it was in 2008, and fans have had plenty of opportunities to see outdoor hockey between the annual Winter Classic, Heritage Classic, Stadium Series, and so on. With so many outdoor games being played, it makes sense that the television ratings have dropped over the past few years. 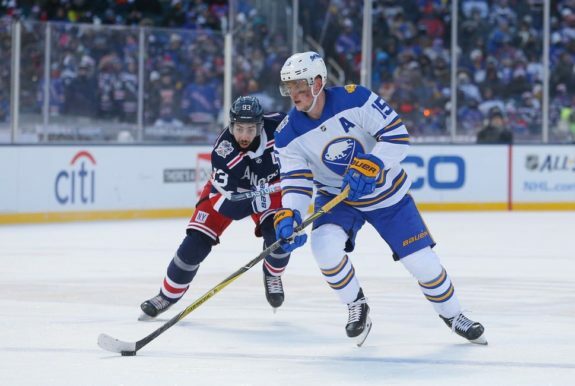 This season’s Winter Classic between the New York Rangers and Buffalo Sabres, for example, drew in 2.484 million viewers, good enough for a 1.42 HH rating. That rating marked the lowest rating for a Winter Classic to date and the fourth-straight year of declining Winter Classic television ratings. But don’t be fooled by the declining ratings—the Winter Classic still provides a boost in ratings for NBC’s NHL coverage. This season’s Winter Classic, despite being the least-watched Winter Classic, was still the 12th-most-watched NHL broadcast ever to air on NBC. The 11 broadcasts that have registered a higher rating were all outdoor games, meaning that NBC routinely draws in more viewers from Winter Classic games than it does the Stanley Cup Final. But putting ratings aside for a moment, how has the novelty of the event itself changed? On Saturday, I had the opportunity to attend the Stadium Series game between the Washington Capitals and the Toronto Maple Leafs at the Naval Academy in Annapolis, Maryland. Going into the game, I was unsure of what to think about the role of outdoor games in today’s NHL. I’ve always been a fan of bringing the game outside, but I was well aware of the argument that the NHL had diluted the product by bringing so many games outside, and, to be honest, I gave that argument a fair amount of validity. But when I arrived at the Naval Academy, any doubts I had were wiped away immediately. Here’s the thing about outdoor hockey games: While it’s true that NHL fans have had the opportunity to see the game played outdoors before, most fans have only done so from the comfort of their own home. As I spoke to people at the game, I found that most were attending their first-ever outdoor hockey game. And, like myself, they were in awe of the spectacle. Sure, perhaps after a decade of outdoor hockey games, the novelty of turning on your television and watching outdoor hockey from your living room has worn off a bit. But once you step foot inside the stadium, and you see the type of atmosphere that is created when some of the best athletes in the world do their thing under an open sky, it all comes right back. Bringing the game back outside hits home for hockey fans, and everyone seems to be on the same page about it. Instead of going to watch a hockey game, I saw a stadium full of people—fans, players, heck, even media members and security guards—who were celebrating hockey. I watched veteran media members, who have been to countless hockey games, step outside the comfort of the warm press box to experience the atmosphere of the freezing-cold stadium. To me, that says it all. To be frank, I’ve never seen so many freezing cold people having such a good time before. Even a power outage halfway through the third period wasn’t enough to shake the spirit of the fans, who pulled out their phone lights, sang, and enjoyed the extra time they had to take in the event. And the opportunity to honor our service members at a location such as the Naval Academy only made it that much sweeter. At the end of the day, tens of thousands of fans battled through the bitter cold (and brutal wind, I might add) to pack Navy–Marine Corps Memorial Stadium and experience something that was truly special. The spectacle was unlike anything I had ever seen live before. It was hockey in its purest form, in an electric atmosphere unlike any other. So before you write off next year’s outdoor games as a gimmick, money-grab, or overly-diluted product, think about trying it out for yourself. It just may change your mind.